Be the first to share your favorite memory, photo or story of Cheryl Ann. This memorial page is dedicated for family, friends and future generations to celebrate the life of their loved one. 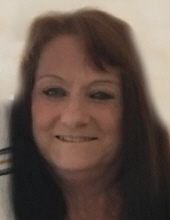 Cheryl Ann Carpenter Cintorino, 59, of 105 Reese Drive, Danville, Va., passed away on Saturday, November 17, 2018, at her residence. She was born November 21, 1958, in Danville, Va. to Margaret Willis Carpenter and the late Robert J. Carpenter. Mrs. Cintorino was married to Fred Cintorino, who survives, of the residence. She attended Hope Church, Danville, and she loved children. She was a professional nanny because of her love of children. In addition to her mother and husband, Mrs. Cintorino is survived by her son, Brandon Adkins of Danville, two sisters, Lynette Harper and husband Robert of Danville and Dacia Spence and husband Larry of Ringgold, Va. one brother, Scott Carpenter and wife Audree of Garner, NC, as well as a number of nieces and nephews. In addition, she is survived by grandchildren Danielle and Ryleigh Adkins and a very special child dear to her, Baylor Gilliam-Hong. Mrs. Cintorino was predeceased by her son, Brian Adkins, in addition to her father. Funeral services will be held at 2:00 p.m. Wednesday, November 21, 2018, at Norris Mt. Hermon Chapel with Rev. Brian Edwards officiating. The family will receive friends from 6 – 7:30 p.m. Tuesday, November 20, at the funeral home and at other times at the home of her sister, Lynette at 312 Slaughter Ave., Danville. Norris Funeral Services, Inc. & Crematory, Mt. Hermon Chapel, 3995 Franklin Tpke., Danville, Va. is respectfully serving the Cintorino family. Online condolences may be made at www.norrisfuneral.com. To send flowers or a remembrance gift to the family of Cheryl Ann Carpenter Cintorino, please visit our Tribute Store. "Email Address" would like to share the life celebration of Cheryl Ann Carpenter Cintorino. Click on the "link" to go to share a favorite memory or leave a condolence message for the family.